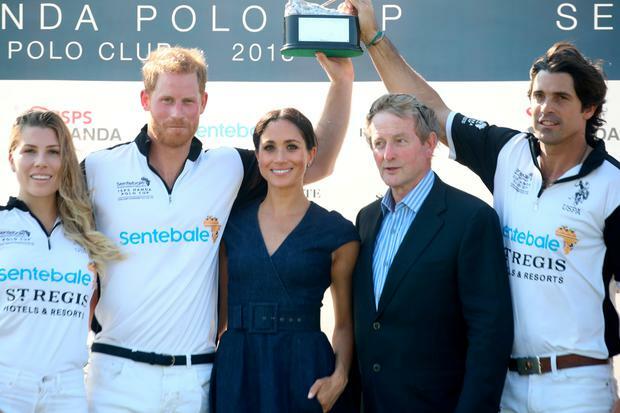 FORMER Taoiseach Enda Kenny made a surprise appearance at a charity polo match where he posed with Meghan, the Duchess of Sussex. Mr Kenny looked dapper in a blazer and blue and white striped shirt as he stood beside Meghan during the trophy presentation. Both were guests at the Sentebale Cup which was held at Windsor, where Prince Harry's team emerged victorious. Meghan presented the winning trophy to her husband and gave him a rare public kiss. Mr Kenny appeared to have a few words with Prince Harry just before the presentation. The Sentebale Cup has become an important annual event raising funds and awareness for Harry's charity Sentebale, an organisation which works with children and teenagers in Lesotho and Botswana who are coming to terms with being HIV positive, have Aids or have lost their parents to the disease. 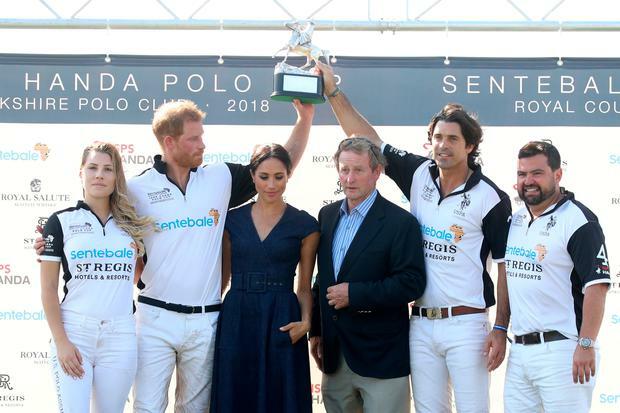 Nacho Figueras, who is a Sentebale ambassador and was invited to Harry's wedding with wife Delfina Blaquier, said about Meghan: "She's lovely, she's wonderful, I'm very happy for Harry. "I think they're both lucky to have found each other, I'm very excited about this new chapter in his life." He said about his brief chat with the duchess while on stage: "She said that she enjoyed the game. She watched the game with my wife, which is wonderful because they were able to talk about polo and she could learn more about the game." Writing in the event's official programme, Sentebale co-founders Harry and Lesotho's Prince Seeiso said: "Since we established Sentebale in 2006, the charity has developed robust programmes - founded on education, care and psychological support - that give hope to thousands of children and young people affected by HIV every year. "Despite this progress, adolescents continue to be at greater risk of HIV infection, with 1,700 young people newly infected with HIV each day. "Research shows adolescents are lagging behind on multiple fronts, their knowledge of HIV, testing, treatment and prevention reflects the stigma that is preventing young people from accessing lifesaving health services." Spectators and guests at the match would have been invited to dine on a starter of asparagus and prosciutto, and for the main course a roasted rump of salt marsh lamb, followed by a trio of desserts including raspberries and cream. Others guests present included former England rugby star Mike Tindall, who is married to the Queen's granddaughter Zara Tindall.